I am a â€œfortyeighterâ€. In 1948, I was shivering out the longest, coldest winter of the century as an RAF squaddie at Innsworth, near Gloucester. The massive camp serviced the RAF Record Office. Stalingrad, we called it. After 10 bitter years of danger and deprivation, the first March sunrays on frozen Cotswold hills were an omen of something better. Cheltenham racing was up and running. That season, too, I could break camp and see the game of my life – Johnny Careyâ€™s Manchester United defeating Aston Villa 6-4 in the first round of the FA Cup. Homeless Manchester United – Old Trafford was bombed out – had to beat a First Division club in every round before overcoming Stanley Matthewsâ€™ Blackpool 4-2 in the Wembley Final. The romance of pre-war â€œfag-cardâ€ images had become a reality. In the Naafi we listened in rapt silence to John Arlottâ€™s tones pacing the run-up of Lindwall and Miller to Hutton, Edrich and Compton. Bradmanâ€™s Australians were here for the first time in 10 years. Totemic figures were back. Gordon Richards again failed to win the Derby, but Henry Cotton (pictured left) was Open champion for the third time at Muirfield. A Britain starved of sport but schooled in Service discipline went on to organise a London Olympics that made a profit of nearly Â£20,000. Sport was starting afresh, and so, to a great extent, was sports journalism. Sports detail was best gleaned from the newspapers, truncated as they were. The nationals led off with bristling, larger-than-life reportage from such as Peter Wilson (Mirror), Jim Manning (Mail) and Clifford Webb (Herald), all sounding off regularly on BBC Sports Report while radio remained king. It was difficult being both a sports journalist and a player. There were no floodlights or heated pitches. The action was primarily at the weekend. On the Sussex Daily News, Brighton Argus or Brighton Gazette, you reported not just sport but the business, politics and behaviour of a large town – not a bad university for a 16-year-old school-leaver. No cars in those days for local journalists. I trotted up to Hove County Ground to play Thursday cricket for Brighton Brunswick knowing that Hove court adjourned all its Thursday motoring charges in half an hour. Later in the evening, you did the police and hospital calls – and a few pars on your match. You got to play with Sussex players such as George Cox, Charlie Oakes, Kenny Suttle, Jim Parks, Peter Laker and Ian Thomson as they limbered up for the season or returned after injury. There was easy interaction. Parks had been at my grammar school, his father Jim coaching us in the ways of 3,000 runs and 100 wickets in a season. Jim junior later wrote for magazines. Peter Laker went on to become the Mirrorâ€™s cricket correspondent. Leslie Lacey was editor of the Sussex Express at Lewes. From the way he worked with touchy local soccer administrators, you saw how he could criticise but stay informed. His son, David, was to prove a chip off the old block. The Argus sold 100,000 in those days, and Lancashire at Hove was one more reminder of the power of the provincial press – a retinue of Denys Rowbottam, Eric Todd, John Kay, John Woodcock and Don Mosey would be in the ground for the match. Yorkshire at Eastbourne was little different, its press box entourage fronted by the gentlemanly Bill Bowes and magisterial Jim Kilburn, a sweep of whose hand prevented the slightest encroachment before the Press tent. Hutton, Lowson, Wilson, Taylor, Watson, Close, Illingworth, Truemanâ€¦ some team to report. Brighton was a hard place to leave but economics demanded it. Speed and accuracy were what an evening paper taught and, in 1954, what Reuters needed too. With the help of my old editor, John Chilman, by this time of the Press Association, I was taken aboard. Jack Davis, subsequently a tyro in SWA affairs, commanded a desk in receipt of cabled reports that we transcribed on upright Remington typewriters, a dozen flimsies at a time for major events. For Len Huttonâ€™s historic triumph on the 1954-55 tour of Australia, Reg Hayter, then of PA, provided the cable service. The link between Singapore and Darwin was notably corrupt, and as the primary night man it was my job to knit it together with the short-wave radio commentary relayed down my telephone by Reuterâ€™s monitoring station at Green End. The cables dutifully dried up on every occasion Johnny Wardle was flinging his bat for an England victory, while the snatched telephone offered the static of a New Orleans jazz 78. Walking home at 8am from Purley Oaks station to my digs, it was good to see a light in the eyes of people tramping to work in the other direction. The war had been a damning thing. 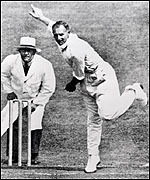 As a boy I had seen Hedley Verityâ€™s seven wickets for nine runs on a drying wicket against Sussex at Hove, his last wicket with his last ball the last act of county cricket for six years. As the Panzers rolled through Poland, the dayâ€™s play was permitted only because it was the benefit of my later tutor, Jim Parks senior. Verity (pictured right) led the bowling averages at the end of his career as he did at the beginning 10 years earlier. He never returned from the war. A captain in the Green Howards, he was hit in the chest leading an attack on a well-defended farmhouse near Catania, Sicily. â€œKeep going, and get them out of their farmhouse,â€ were his last known words. His unit had to withdraw, leaving him with his batman holding his head against the light of burning corn. Verity died in captivity a few days later. This is the latest in an on-going series of articles about covering sport over the past six decades. “It was difficult being both a sports journalist and a player”. I have been in this situation as well but somehow I managed to do justice to both of them.